At present operators of cable networks (ОКС) are forced by globalization and integration factor of networks. Quick development of technologies, liberalization of networks, and instability of telecommunication market make difficult selection of equipment for ОКС. In this light more advantageous position at telecommunication market concerning rendering services to cable television networks. We can notice certain growth of number of subscribers of these networks and their competitiveness as for data transmission and rendering different services to population. As a result of integration and relationship of networks there is more and more important question of rendering appropriate service quality and technical maintenance of these projects. All these trends leave their mark on architecture of building and developing of the modern head stations (ГС). Increasing effect of scalability and flexibility of ГС, with purpose of reducing of overhead costs requires for paying attention to such parameters of station like minimization of station sizes, high degree of integration, reduction of power consumed, automatic detection of network configuration, open standards and protocols and many others. This station corresponds to the first class according to European standard classification CENELEC EN 50083-5 and includes: units of reception and processing of television signals, optical reception-transmission units, including WDM units, head equipment of return channel, scrambling modules, coders, decoders…, multiplexing/demultiplexing units, monitoring , control system etc. Wide possibilities of this station, flexibility and scalability allow to use this station in the networks of any both regional and national scales. Base platform of DVX station has standard dimensions: width 19" and height 6U. All station modules are performed in accordance with telecommunication standard ETSI, that provides physical migration of signals into telecommunication services. Along with power supply and output amplifier in rack one can install up to 9 different modules of station. Union of output signals of separate rack modules as per RF is carried out with the help of integrated directional coupler with high decoupling without any jumps with F-connectors. When installing modules into rack automatic switching as per RF frequency, supply and control occurs, no connecting wires, highly reliable connectors. In case of translation of several channels in the network one can use rack without wideband combiner. The whole range of products Teleste: DVX, DVXtend, DVO и ATMux™, based on this platform. Typical head station DVX subject to specifically solved tasks consists of set of racks, each rack or several racks create groups. Modules in each group can be formed in accordance with kind of output signal, output frequency, functional features of signals etc. Output signals from each rack are united by means of combiners and then come to optical part that in its turn translate signals into HFC network. In case of translation of little number of channels output signal from rack can be directly connected with optical transmitter that gives required flexibility to station at further development. The highest station integration degree results in reduction of total number of station modules. Each station module is functionally completed and at the same time can be flexibly modified as per the customer’s request. All the initial processing of outcome signals (RF, A/V, DVB-S, DVB-C, DVB-T) is performed inside one station module. One station rack can contain different quantity of modules different by functional purpose. Practically, one 19"station cabinet, can perform processing of more than 100 TV channels and occupies just 0,5 m2 in area. Powerful power sources with high efficiency allow reducing general consumed power and reducing overhead costs. The low level of power consumed by station reduces heat emission that allows to exploit station at natural ventilation reducing costs for space conditioning. Not high temperature of rack modules, wide temperature range provide increased reliability of station. In case of exceptional conditions of operation the unit of ventilation module is provided in the station that traces temperature mode of station and switches air ventilation if required. This strategic decision is based on understanding that future systems and networks will be a single organism and based on single open more perspective standards. All component elements of DVX platform are based on this principle. All analog systems of station are performed in accordance with requirements of European standard CENELEC. Digital systems correspond to requirements of DVB, SDH, ATM и DAVIC standards. At present many customers pay their attention to improvement of sound quality transmitted via networks in connection with translation of TV channels in DVD format with sound Dolby 5.1. The best technology for further sound transmission through network for analog TV channels is a format NICAM stereo. However, adaptation to NICAM system in the modern CATV ГС leads to considerable cost increase. This contradiction between increasing sound quality and increasing cost of station is practically minimized in TV modulators DVX, where NICAM coder is directly integrated into the modulator itself without additional increase of number of station modules. The similar method is used also at displaying sound in format А-2 stereo, to usual processing of audio sub-carrier, it also supports format ADR (Astra Digital Radio). Other FM station modules support standard functions of converting FM channels and wide-band amplification. Filtration of PID identifiers (packages), as well as operation of processing NIT tables is usually functions of remultiplexer. However, sometimes it is necessary to perform processing of tables DVB channels not only for formed packages of programs at ЦГС, but in individual digital ПГС channels. So PSI/SI functions of processing are included into all digital station modules with output interface DVB-C.
That is not a secret that in the foreseeable future digital methods of transmission of TV channels will prevail. In the nearest time all satellite transponders will be transferred to digital broadcasting due to evident advantages. ГС DVX has all required spectrum of equipment for processing of both open and encoded digital programs - series DVD. In the nearest time this series will be added with module of satellite digital remodulator with integrated MPEG-2 decoder and CA interface. Package of software products CATVisor provides all richness of variety of different possibilities of system. Each DVX module contains microcontroller with programmable flash memory that gives possibility to perform upgrade of software applications. The bas of these software products is CATVisor Commander. With its help all necessary operations on configuration of modules of station DVX are performed. With help of CATVisor Commander, one can set input and output frequencies, video and audio levels, frequencies of pilot signals, routing and many others. Possibilities of system can be extended by way of installation of additional software applications. One of such software applications is editor of digital flows PSI/SI Editor, along with Service Organiser are simple and suitable tool to create its own services. Software of CATVisor family consists of different applications, that can scaled from simple configuration to complete system of management of network elements that provides control of all equipment Teleste from ГС to the last amplifier in chain. CATVisor EMS System is a system of management of network elements installed at server and intended for monitoring of large ГС, as well as hybrid fiber-coaxial transport networks, allows to perform operative disconnections and connections, form statistics of events and many others. To configure elements of network one can also use functions of EMS system. CATVisor Voyager is an application for sending messages of network state by e-mail and to mobile phones that can be integrated with Backup Server or EMS Server. SNMP Voyager supports operation with any software compatible with SNMP V1. This allows receiving full report and configuring equipment of other manufacturers supporting this protocol as other manufacturers to control equipment Teleste. Backup Server, allows to provide automatic replacement of failed station module (function N+1). Series of ATMux™ products is a scaled and flexible decision for processing and transmitting of digital signals of DVB-S, DVB-T,DVB-C formats via АТМ networks that provides connection between Central and Regional stations both by marked fibers and by optical networks of SDH/SONET or АТМ standard. There is not a secret that networks based on АТМ and SDH among high-speed methods for data transmission are widely used in our country and throughout the world. Almost 90 percent of today’s Internet traffic passes through ATM-networks. That is a reason to make such decision. We’d like to attract your attention again to usage of open standards. The systems based on this principle allow to operator to provide easy connection to other networks in case of new kind of activities, as well as combination or acquiring of the current systems. In the centralized network architecture packets of services are created at ЦГС for further distribution to Regional Station. In the distributed architecture of network services both open and encoded are transmitted to Regional Head stations as SPTS. This provides for operator complete free choice in creating of his own packets of services. This system maintains both centralized and distributed architecture and any intermediate decision between these two alternative ones. Besides, all modules of this system have flexible architecture and can be completed directly for specific requirements of any operator saving his own means. The heart of ATMux™ is a multifunctional network unit providing adding, excluding or transmitting of information. This device has interfaces STM-1 (electrical part) and STM-4с (optical part), based on the current open standards. This allows performing transmission of digital information via different communication means. Operator can make a choice between marked optical network (dark fibre), SDH/SONET or network АТМ, i.e. select the more suitable decision. Approximate quantity of translated channels as per 5 Mbit/s each will amount - 200. This capacity can be easily increased when using WDM, SDH multiplexing in STM-16 or DWDM, up to 20 Gbit/s. Availability of standard interfaces ATMux™ also allows to transmit IP traffic in virtual channel, PVC, between Head Stations. Equipment of DVO series is an integral part of ГС series DVX. The wide range of optical transmitters (1310 nm) of various power capacities from +3 to 15 dBm is based on reliable lasers of DFB-technology, combined with precorrector of high-frequent signal, providing optimal linearity and high value of ratio С/Ш. All DVO transmitters have integrated preamplifier allowing operating with low input levels of RF signals and having high technical specifications. All modules are controlled with microcontroller and fully compatible with CATVisor management system. Where it is required for you to transmit signal to longer distances or use maximum output power for division of signal one can use equipment operating at length of wave of 1550 nm. This equipment allows providing signal transmission to the distance up to 100 km or longer when using optical amplifier EDFA (Erbium-Doped-Fibre Amplifier). The transmitter is equipped with powerful laser with electronically linearized modulator having several outputs. DVO701 transmitter has defocusing adjustment for optimization of transmission range and distribution of laser ray in fiber. When developing optical transmitters a great attention was paid to requirement of system reliability. This series also includes wide range of DWDM equipment allowing transmitting by one fiber several lengths of waves at once, increasing bandwidth capability of system. 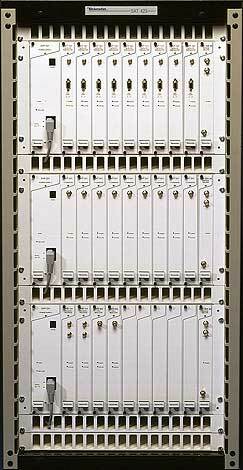 Technology of optical multiplexers WDM is also used for data transmission by return channel. For example, in this case once can use length of wave of 1310 nm for data transmission in direct channel, and 1550 nm – in return one. We’d like to note that one of the key decisions of Teleste Access Systems is possibility of manufacturing equipment and technical decisions for different specific customer’s needs. For example, DVO platform offers number of ports selected for aims of entering narrowband services. At this base decision already includes means for further development. Besides, Teleste Company confirms its readiness to continue developing decisions oriented to the Customer if available systems are not sufficient. RF-combiner/splitter (to summarize racks), module 19"